Our pricing policy is fixed. Your quote is not an estimate. We learn what you need and then use specific criteria to itemize a set price. When you receive a quote from one of our authorized representatives, this price is all-encompassing, and unless circumstances change, there will be no hidden costs or miscellaneous fees. Prices below are expected ranges based on existing clients. The fee structure for limited-scope 401(k) audits range as low as $8,000 for plans that fall below 500 participants to as high as $11,000 for plans that fall between the range of 1,000 and 1,500 participants. Plans with greater than 1,500 participants are determined on a case-by-case basis. See our fee structure below. *A 10% discount is available if the fee is paid is full within 45 days after the Plan year end. For calendar year plans (ending December 31st), the fee must be paid in full by February 15th in order to qualify for the discount. A $1,500 additional fee will apply to the fixed fee listed above for each plan size when a full-scope audit is required. A full-scope audit is required when the trustee or custodian does not or cannot certify both the accuracy and completeness of the information submitted as it relates to the investment information. 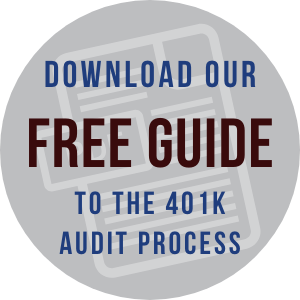 We find that most 401k audits tend to be limited-scope audits, where assets are certified by the custodian/trustee. A $1,000 additional fee will apply to the fixed fee listed above for each plan size if the current year audit is the plan sponsor's first required audit (or first time audit with Summit CPA). When a prior year audit is not required, the current year auditor is required to test prior year balances and compile the prior year financial statements. A $750 additional fee will apply to the fixed fee listed above each plan size if the plan sponsor has changed its custodian/trustee during the current audit year. A $750 additional fee will apply to the fixed fee listed above each plan size if the plan sponsor has changed its payroll provider during the current audit year. Is your plan a multi-employer plan, meaning more than one company is sharing a 401(k) plan? If you have between 1-3 companies, your price won't change. For each additional company in a multi-employer plan, an additional fee of $500 will be applied. If your plan is a final plan audit, call us for a pricing quote. Alabama, Arizona, California, Colorado, Delaware, Florida, Georgia, Idaho, Illinois, Indiana, Kentucky, Louisiana, Maine, Maryland, Massachusetts, Michigan, Minnesota, New Jersey, New York, North Carolina, North Dakota, Ohio, Oklahoma, Oregon, Pennsylvania, Rhode Island, South Carolina, Tennessee, Texas, Utah, Virginia. Your state not listed? No worries. It only takes us a few weeks to get registered, and then we'll be able to perform your audit. Need a 401(k) Audit? Let's chat! "I wanted to take a quick moment to tell you what a fantastic job Lisa & Kim did on our 401(k) audit. This is the third year your company has performed an audit for us. Lisa & Kim’s expertise, professionalism, and demeanor is second to none. They gave me the additional push when needed to get this done in a timely manner. All in all, I couldn’t be more pleased. Please ensure they are recognized accordingly."